1. Preheat the oven to 150°C, gas mark 2. In a bowl, toss the lamb steaks with the ras el hanout, mint, and flour, and season generously. 2. Heat the oil in a flameproof casserole dish and fry the meat over a high heat in batches to seal and brown. Remove from the dish with a slotted spoon and set aside. 3. Add a little more oil to the dish if needed and fry the onions in the remaining flour and spice mix until golden and soft. Add the garlic and continue to cook for 1 minute. Return the lamb to the dish along with the stock, tomatoes, cinnamon stick and honey. 4. Bring the tagine to the boil, cover with a lid and place in the oven to cook slowly for 2 hours, until the meat is tender. Half an hour before the end of cooking, stir in the apricots. 5. 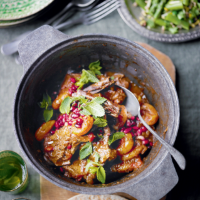 Serve the tagine scattered with the pomegranate seeds, mint leaves and lemon zest.